Our lawyers offer estate planning, probate and estate administration as well as business planning services to assist individuals and families at all stages of life. We serve Roseville, Placer County, the San Francisco Bay Area, and all of California. Whether you need a probate lawyer, estate planning attorney, or other legal service, we support individuals and families with comprehensive planning solutions. Our attorneys have diverse backgrounds, with experience handling small estates, very large estates and executing advanced planning techniques. We are able to advise clients at all stages of life, from starting a business to planning for future care to administering an estate. You will have an attorney who listens carefully and provides strong, practical and thoughtful guidance. Estate planning involves more than drawing up a will. We handle planning for estates of all sizes, including those in need of complex planning techniques. Litigation over trusts & estates is all too common. Often, disputes and oversights happen because those handling the case aren�t qualified to litigate disputes. Our attorneys will use our expertise in all areas of business planning to tailor an asset protection plan specifically for you that minimizes risk. Succession planning is a critical aspect of ensuring your company�s successful transition in a way that honors your wishes and maximizes hard-earned profits. David was very easy to work with on a fairly involved estate planning matter. He knows how to explain complex issues to clients or ordinary taxpayers in a simple and easy to understand way, which can be quite challenging. David Wade is an expert on real property law. He guided me and my family through a probate involving my mother's estate. He was prompt, polite and patient in answering questions and keeping all family members informed during the process. 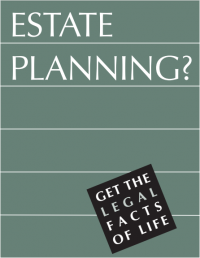 Plan for your future today with this free guide to estate planning and asset protection.